The San Diego LASIK Institute offers AMO's newest and best wavescan system, the iDeisgn. iDesign Advanced Wavescan System - Smart and Powerful LASIK powered by NASA like techonology. LASIK powered by iDesign has made your procedure smarter and better. iDesign incorporates custom wavefront technology similar to that used in NASA telescopes. In custom LASIK, a special device called a wavescan maps out your optical system to measure your detailed prescription and give us advanced information (higher order aberrations) about your eyes. 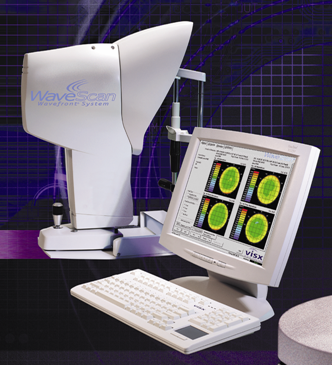 This wavescan is then used to complete a completely custom laser treatment of your eyes. iDesign takes an already innovative technology and improves it by giving it 5x the definition of previous wavescan technology. It also gives us additional information about your eyes through advanced corneal imaging. 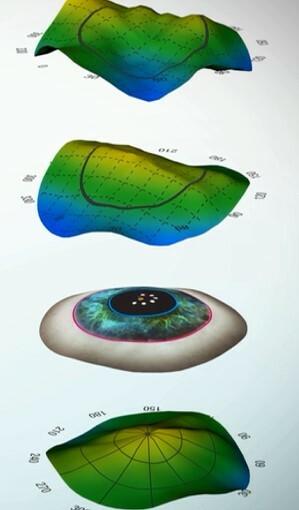 It works like a computer "brain" and it captures more data than ever before to get a detailed map of your eye's unique imperfections to accurately create a treatment. The iDesign system is smart technology that creates a unique and personalized map of your eye. It accomplishes this by shining a light into your eye. As the light travels through the eye, it passes the cornea, lens, and vitreous humor. The light then travels back to the device and through an advanced imaging device called a Hartmann-Shack aberrometer. This information is then compared to the behavior of light passing through an ideal eye with no nearsightedness, astigmatism, or imperfections. By looking at the differences between a perfect eye and your eye, a detailed map of your eye is made. Just like a fingerprint, no two wavescans are exactly alike. This increased resolution allows us to capture more points to create a more detailed and customized map of your eyes. The measurements are up to 25X the resolution that is normally used when you get measured for glasses and contacts. The images compare the iDesign's resolution to a traditional custom wavescan. The iDesign is able to capture more refractions (measurements). The two devices are imaging a key placed over an artificial eye. This helps to allow for more accurate mapping of the key. The iDesign allows for a more accurate mapping of the key. Unfortunately, the iDesign is not approved for all patients or prescriptions. Our LASIK surgeon (Dr. Pham) or our center optometrist (Dr. Darrow) will be happy to discuss with you which technology (CustomVue or iDesign) is best and FDA approved for your prescription. What types of measurements can the iDesign get in 3 seconds? • Wavefront refraction - This measures your prescription. 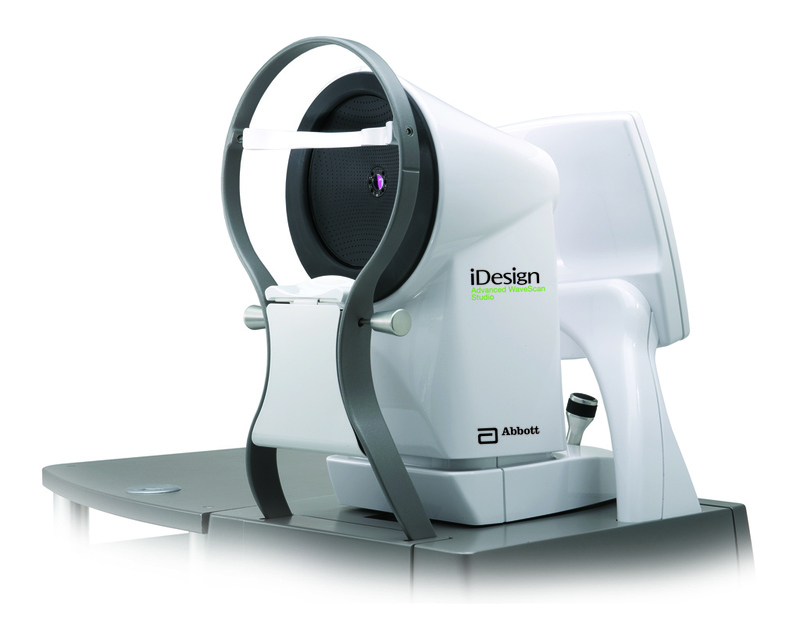 The newer iDesign has 5x the resolution of traditional CustomVue wavescan LASIK. • Wavefront aberrometry - This measures complicated imperfections of your eyes. These "higher order aberrations" are then treated with the laser. • Keratometry - This measures the steepness or curvature of the cornea. It also automatically incorporates it into your LASIK treatment to make the LASIK procedure safer. • Pupillometry - This measures pupil diameter under controlled cark (scotopic) and bright (photopic) lighting conditions. The iDesign is able to improve iris registration by taking more high-quality measurements. Iris registration uses your iris' unique landmarks to compensate for your eye's rotation when you are laying down. -5.00 D cylinder; with agreement between manifest refraction (adjusted for optical infinity) and iDESIGN® System refraction of 1) spherical equivalent: magnitude of the difference is less than 0.625 D, and 2) cylinder: magnitude of the difference is less than or equal to 0.5 D; with patients 18 years of age or older, and with refractive stability (a change of ≤1.0 D in sphere or cylinder for a minimum of 12 months prior to surgery). CONTRAINDICATIONS: Laser refractive surgery is contraindicated in patients with a) collagen vascular, autoimmune, or immunodeficiency diseases; b) pregnant or nursing women; c) keratoconus, abnormal corneal topography, epithelial basement membrane disease (EBMD) and degenerations of the structure of the cornea; d) symptoms of significant dry eyes; e) corneal thickness would cause anticipated treatment would violate the posterior 250 microns (μm) of corneal stroma; f) advanced glaucoma; and g) uncontrolled diabetes. If the patients have severely dry eyes, LASIK may increase the dryness. This may or may not go away. Severe eye dryness may delay healing of the flap or interfere with the surface of the eye after surgery. It may result in poor vision after LASIK. WARNINGS AND PRECAUTIONS: LASIK is not recommended in patients who: a) have a history of Herpes simplex or Herpes zoster keratitis, b) have severe allergies or tendency rub their eyes often, c) are taking the medication Isotretinoin (Accutane), d) are taking antimetabolites for any medical conditions. The safety and effectiveness of this laser for LASIK correction have NOT been established in patients: a) with progressive refractive errors; previous corneal or intraocular surgery; or trauma in the ablation zone, b) who are taking the medication Sumatriptan (Imitrex) or Amiodaronehydrochloride (Cordarone), c) with corneal neovascularization within 1.0 mm of the ablation zone, d) over the long term (more than 1 year after surgery), e) for patients who engage in activities that could endanger or damage the LASIK flap, f) for patients who have a family history of degenerative corneal disease, g) history of inflammation of eye, h) for patients who have a history of crossed eyes (strabismus) or who have undergone strabismus surgery, i) prior LASIK or Refractive Surgery, j) with history of any eye diseases or abnormalities such as: corneal scars or active disease, k) whose BSCVA is worse than 20/20. To reduce the risk of corneal ectasia, the posterior 250 microns (μm) of corneal stroma should not be violated. The treatment of highly myopic eyes necessitates the removal of significant amounts of corneal tissue. The iDESIGN® System calculates the estimated residual bed depth using thepachymetry and intended flap thickness entered by the user. Actual flap thicknesses may vary. If the estimated residual stromal bed is ≤ 320 microns, an in-the-bed pachymetric measurement should be performed. CAUTION: U.S. Federal Law restricts this device to sale, distribution, and use by or on the order of a physician or other licensed eye care practitioner.